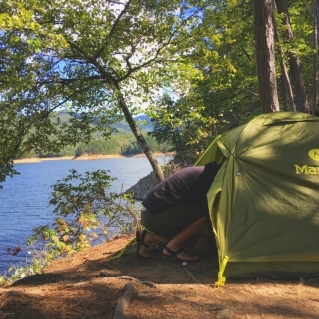 Pouring rain and streaks of lightning held us in our tent in Bryson City, North Carolina. We had just set up camp when the first raindrops fell, forcing us to abandon the tarp and hunker down. Waiting out a storm relaxed and dry with the crisp mountain air flowing through a tarp is enjoyable, but the cramped space and stale tent air resulted in restless children. So we chose to take a drive to wait out the storm. 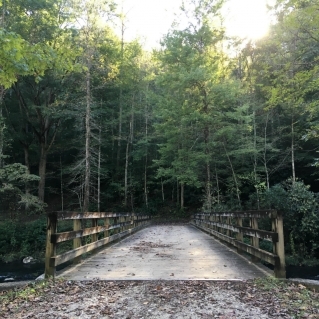 On our way through town we crossed into the Great Smoky Mountains National Park stumbling upon The Road to Nowhere. 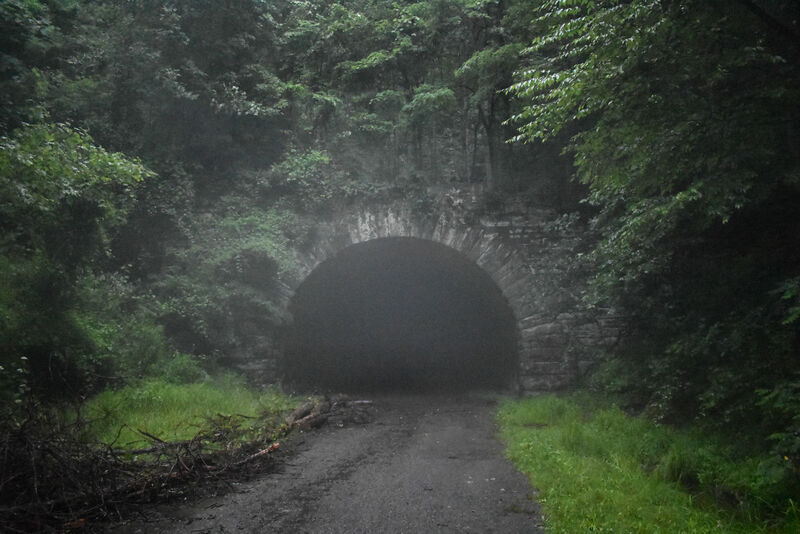 We sought shelter within the tunnel, hiked through and watched the sky unleash around us. An empty road left me wondering. 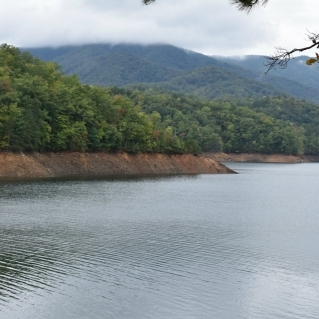 During the production of the Fontana Dam, the Federal Government promised a new road to replace the deeply sunken Highway 288. They completed only six miles before issues arose that led to the end of the proposed Lake Shore Drive. Once a hope for a community called Proctor, Lake Shore Drive became a broken promise and would forever be known as The Road to Nowhere. 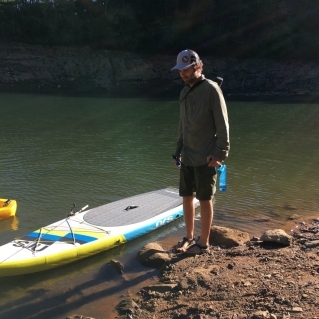 We were on the quest for a training paddle for our 215 mile SUP of the Neuse River. Hurricane Florence sidelined our original plan to SUP to Shackleford Banks, a barrier island off the North Carolina coast. 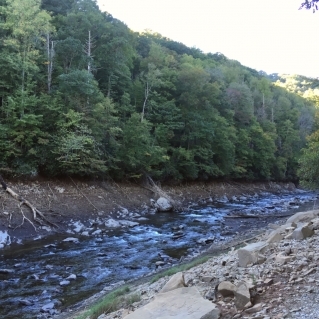 Flooding of surrounding rivers led to a rise in bacteria levels. The rivers fed right back into the ocean. We weren’t comfortable making the paddle. 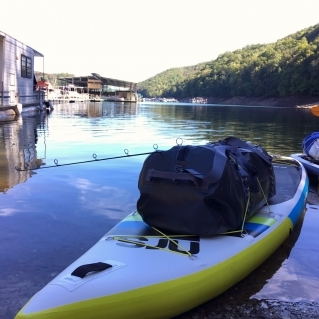 But the initial disappointment of this dream trip faded as we started researching Proctor and Fontana Lake. 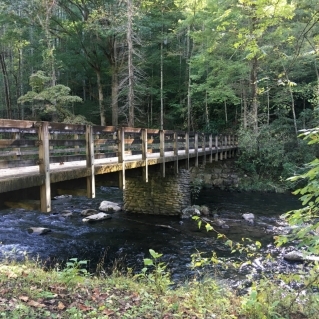 Proctor remains nestled against Hazel Creek (a proclaimed world-renowned fishing spot) and lies under an indescribable forest canopy. 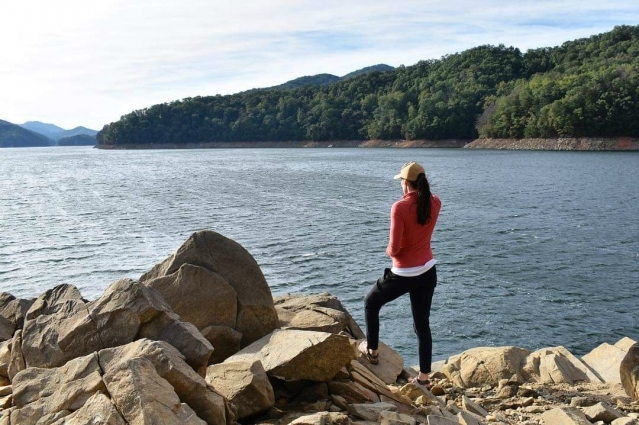 Accessible only by board, boat or foot, you can primitive camp, hike, and imagine how life in the mountains used to be. My husband hooked me in as soon as he mentioned “ghost town.” The spookier it sounded, the more intrigued I became. As we tried booking sites, we realized the backcountry sites in Proctor were quite the hotspot. We couldn’t land a site that would accommodate our group of eight without putting us many miles away from the town itself. We like to hike, but the real appeal was paddleboarding to a ghost town. Who would have known this ghost town would be so popular? 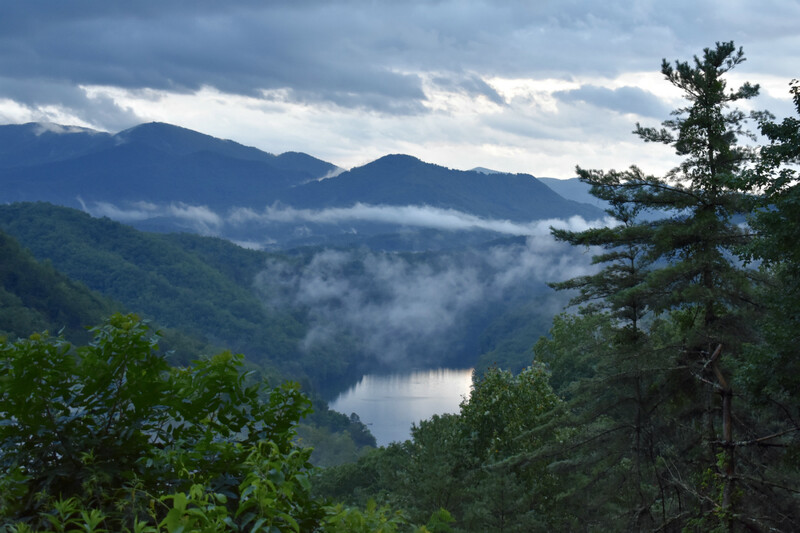 With more calls and research we discovered that Fontana Lake is bordered by the Great Smoky Mountains National Park on one side and the Nantahala National Forest on the other. Meaning, we could stay for free, without a permit on public lands. 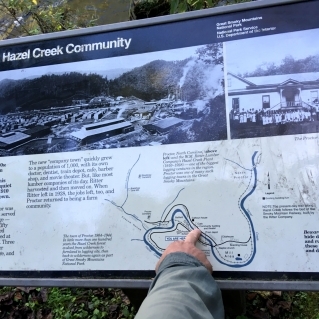 Just past Hazel Creek, an island lies in the center of Fontana. 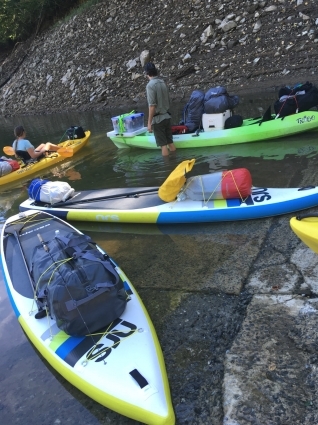 Referred to as the “Big Island,” it’s a mile-and-a-half paddle from the marina and a two-and-a-half mile paddle to Proctor. Camping on the Big Island is first come, first serve. We hoped the one campsite on the island was empty. Departure date approached along with the second hurricane—Hurricane Michael—within just a few weeks. We threw our Escapes in the back of our van, determined to not let Michael ruin our plans like Florence had. As we passed, no lie, 200 power-utility trucks on the way to Fontana, we hoped we would return to a home with power. Until then, we silenced our first world problems. Whether it was remnants of a hurricane or just a blusterous day, the wind made itself known this entire weekend. As we left the marina, the cove wrapped its arms around us giving us the illusion of an easy paddle. But as we broke past the protection of the land, the wind created wakes that belonged in the intercoastal waterway. After an hour-and-a-half of paddling, the Big Island welcomed our fatigued legs with 50′ loose rock ledges. With the steep bank and high wind, we decided to haul our boards uphill and secure them to a tree at the site. As we settled in for the night we had no idea what was in store for us. Crisp air woke us the next morning. A black bear cub slumbered on the bank across the lake. The wind roared outside so, we stayed in the comfort of our tent until after our protein bar brunch. Realizing the weather probably wouldn’t improve, we decided to head out. We pushed off from the rocks and the battle to Proctor began. In the beginning, everyone split up, tackling the wind in their own way. Winds sustained at 20 mph and we constantly switched from standing to kneeling to give our legs a break. Soon, some of the group gathered behind the entrance to a cove just before Hazel Creek. Nearing the group, I happened to look up at the pine-dressed embankment and meet four black beady eyes. One bear cub scurried up the hill as the other watched with equal curiosity. As time stood still, the many articles I read of this bear country we were paddling through reemerged. I lingered in the bear’s stare for a moment then pulled in beside the others to catch my breath. We continued on as a group. As we entered Hazel Creek with its emerald waters, the unbelievable clarity made it look as if our SUPs simply hovered over the rocks below. My husband grabbed the GoPro to capture the illusion. But suddenly the wind caught him. He shoved the GoPro in his unzipped pocket, counter-paddled to fight back the wind and it dropped, barely making a splash. Despite my husband’s best effort, he dove too short—the camera sank too fast—and it landed on the bottom of Fontana. Fighting back the tears of the un-uploaded vacation photos of our kids, we shook it off and paddled on. The creek narrowed and we heard screams of distress. Their echoes bounced off of the mountain walls creating an even more chilling sound. Turning the corner, we realized it was just a few young girls playing up the creek. But it felt like an all-too-appropriate welcoming party as we pulled up to the shore of Proctor. Considering the wind and the fight for daylight, we dropped our SUPs and hiked straight for the Calhoun House. 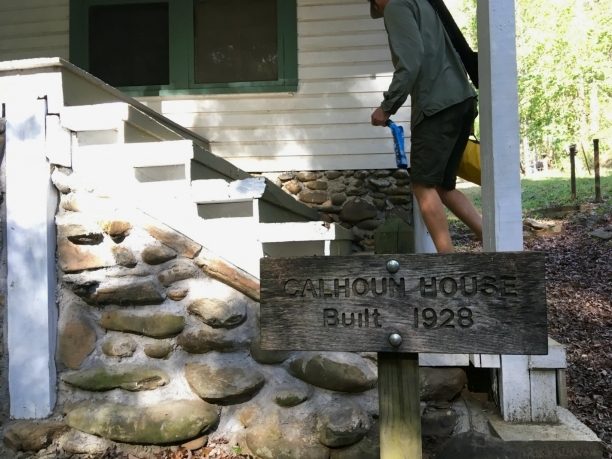 Established in 1928, The Calhoun House was first used as a boarding home and then a hotel. 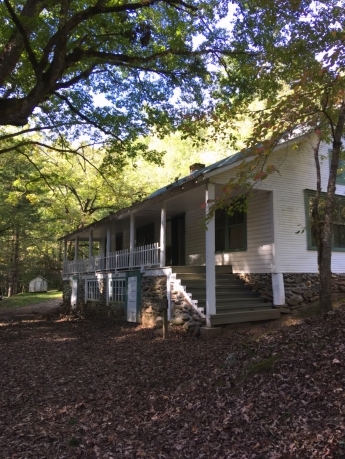 Leaders of Western Carolina often held meetings there and it was known for being the only public place in Swain County where all races could work peacefully and without prejudice. Walking the gravel roads of Proctor was more like entering a mountain hamlet. The singing of the creek and the bustling treetops could captivate the hardest of hearts. Knowing that communities were told that a dam was going up and the life they established would have to relocate was heartbreaking. The Calhoun house was as expected. Empty, eerie, but maintained. The impending return paddle kept us from lingering long. We fought the wind with solid strokes for the taste of campfire coffee. Adapting to my aching muscles, I dropped to my knees and burrowed my head to split the wind. To put the wind blowing through Hazel Creek into perspective, one stroke on my right completely turned me around and sent me, with vengeance, back to Proctor. Never before had I experienced wind like this. Seeing our island on the horizon and remembering the cumbersome climb killed what little relief we felt just making it back to the main channel. But the weight of our Escapes made that 50’ climb up the rock bank effortless. During our daunting paddle, our campfire dance floor the night before had been reclaimed by four new campers. Our spent bodies couldn’t have cared less. We collectively gathered our dinner and firewood to seek the calm of the island summit. The next day we arose to complete tranquility. The lake begged for attention. Taking advantage of her different mood we decided to paddle around. As our group paddled toward the marina, we snuck off into a cove alone. What in recent weeks was an island had become a peninsula, creating a barrier between us and the take-out. As we paddled closer to shore, a bald eagle perched on her nest came into view. 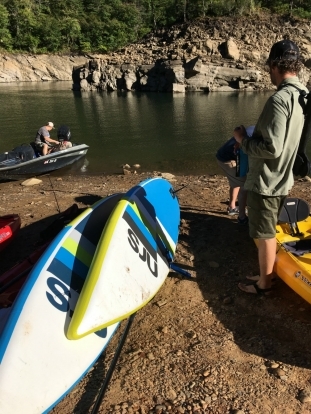 If we didn’t have our Escapes, we never would have considered paddling into the cove knowing that we would have to carry our boards. We would have followed our group and missed this glimpse of nature. Topping the hill, we laid eyes on the marina. 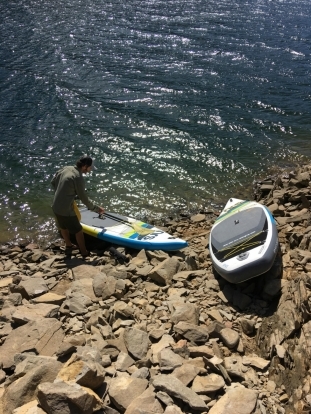 Dropping our boards back into Fontana we loaded our gear and paddled in. I’ve never been so thankful for such an easy de-rig. Once deflated, we threw our boards and duffels in the van and said goodbye to Fontana. 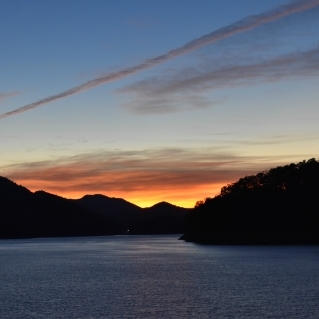 Fontana Lake bordered by the Great Smoky Mountains National Park and the Nantahala National Forest. 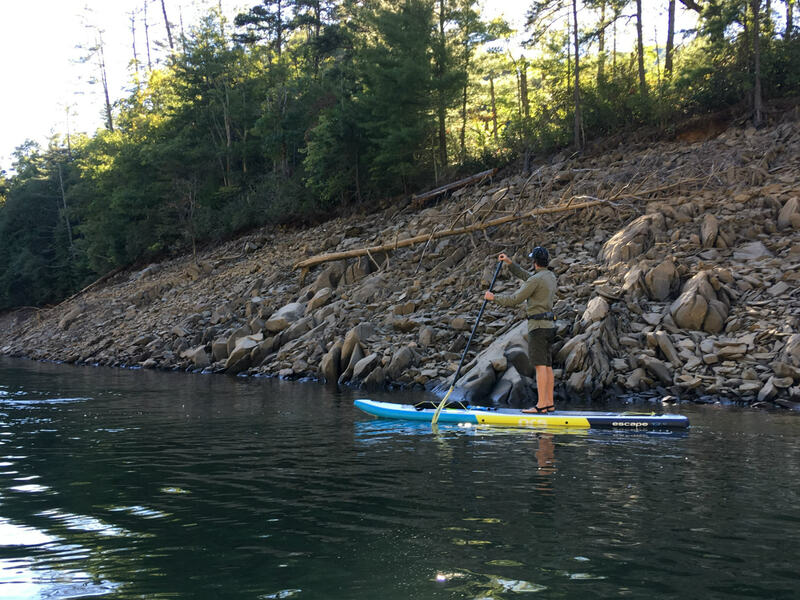 Editor’s Note: Guest contributor, Ashley Hardison, is a stay-at-home mom to two kids with a passion for yoga, stand-up paddling and cooking. 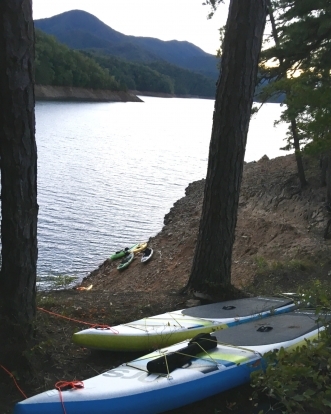 She and her husband plan to paddle North Carolina’s 215-mile Neuse River.